"We have always made our crisps in our own potato crisps factory. We are absolutely dedicated to producing the best potato crisps possible. We cook locally sourced potatoes which we use the finest seasoning to flavour them. 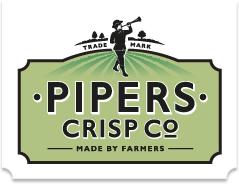 "At Pipers Crisps we search for passionate people who make great food and ingredients for our flavours. Our newest flavour partner is Chris Wildman, a farmer in the Yorkshire Dales National Park. He rears the rare breed Oxford Sandy and Black pigs and has a flock of sheep that graze the grass on the pasture around his farmyard. "Chris is also a fifth generation butcher and charcutier. As well as preparing his own lamb and pork for the local markets and restaurants he makes award winning chorizo. He blends pork with smoked paprika and spices to make a sausage which is dry cured for three weeks which we use to make “Kirkby Malham Chorizo” flavour crisps. "Do not expect to find Pipers Crisps in major Supermarkets because we do not sell to them! "We supply a diverse range of outlets though! Such as Pubs, hotels, delicatessens, farm shops, museums, stadiums and garden centres throughout Britain. Basically, we supply outlets that care about what they sell as much as we do."